Genome biology approaches have made enormous contributions to our understanding of biological rhythms, particularly in identifying outputs of the clock, including RNAs, proteins, and metabolites, whose abundance oscillates throughout the day. These methods hold significant promise for future discovery, particularly when combined with computational modeling. However, genome-scale experiments are costly and laborious, yielding “big data” that are conceptually and statistically difficult to analyze. There is no obvious consensus regarding design or analysis. 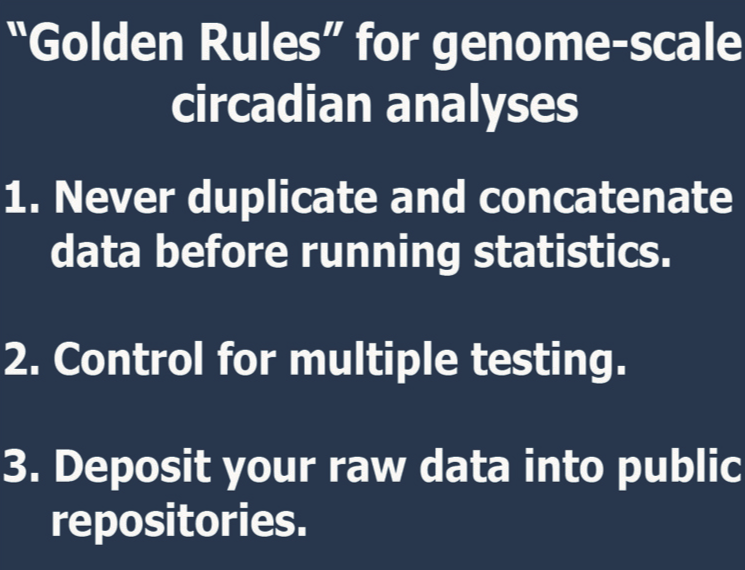 Here we discuss the relevant technical considerations to generate reproducible, statistically sound, and broadly useful genome-scale data. Rather than suggest a set of rigid rules, we aim to codify principles by which investigators, reviewers, and readers of the primary literature can evaluate the suitability of different experimental designs for measuring different aspects of biological rhythms. We introduce CircaInSilico, a web-based application for generating synthetic genome biology data to benchmark statistical methods for studying biological rhythms. Finally, we discuss several unmet analytical needs, including applications to clinical medicine, and suggest productive avenues to address them.